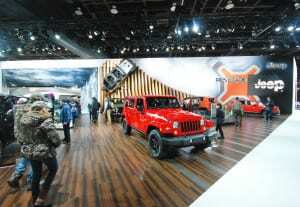 More than 40 new cars were revealed at the North American International Auto Show in Detroit, which opened to the press on Jan. 12 at the Cobo Center. The new models, along with exotic sports cars, pickup trucks and a host of other vehicles, were on display amid giant video screens, two-story arches, sophisticated lighting, interactive games and more, all features of exhibits designed to not only wow but engage the press and the general public. 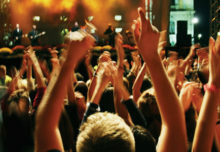 Technology increased dramatically too, with a raft of large screens, video content, high-tech touch points, along with RFID technology to track movement, virtual reality and post-event digital engagements. Here is a look at 12 of the most dynamic displays that were on view at this year’s show. Agency: George P. Johnson. Design Cues/Highlights: X marked the spot at this visually compelling exhibit. You just couldn’t miss the glossy red and silver X form, with the etched stainless steel effect that spanned its wings behind the bright yellow Fiat 500X on display. Experience: This exhibit was more face-to-face than digital since Fiat, like other brands in the Fiat Chrysler automobile group, remains fairly traditional in its exhibits. Other than LED media integrated into the 500X stage, the experience was more about having people come and sit in the cars, check them out and have a discussion with product specialists. Design Cues/Highlights: In addition to the dimensional arch architecture and S-Lounge, the graphic pattern of the car’s front grille served as the primary display element for the interior and exterior surfaces of the display. An interesting touch: in one area, the spaces within the grille pattern depicted the color chips for the cars. Experience: One of the Fiat Chrysler auto group brands to feature a tech story, Chrysler went all out with the Chrysler 200 Oculus Rift Experience. People sat in the car, put on the Oculus Rift goggles and a program unfolded that took them down the car’s assembly line in virtual space. The experience reflected the Made-in-America theme of its TV ads for the 200. 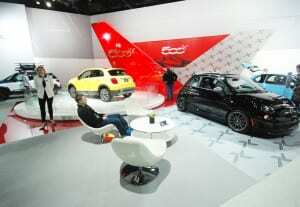 Attendees also recharged their phones in the “S” lounge, which took its name from the sporty 200S and 300S models. Design Cues/Highlights: This architecturally cool stand featured a Jeep climbing a stylized mountain terrain comprised of wood slats lined up against the wall, which showed off Jeep’s capes in a modern and refined way, while another area of the booth offered a wall-sized graphic of snowy mountain terrain in a white, off-road winterscape. A bold orange X shape, which took its design cues from the Renegade, denoted that area of the exhibit and echoed the shape of the stylized wood slats. Experience: Other than an interactive content piece that highlighted the trail-rated technology of its vehicles, this display didn’t really push any really high-tech buttons. Rather, it was all about that Jeep ascending that artful mountain. Design Cues/Highlights: This exhibit featured the Dodge logo, a stylized rhombus or parallelogram with two red stripes, which represents speed and agility, in the floor and on the wall. 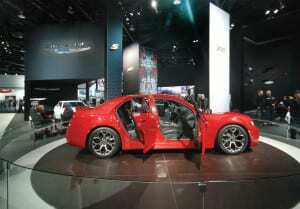 And at a show where space is at a premium, the two glossy red floor stripes provided an unobstructed path that led the eye, and attendees, to the cool red Dodge Viper, the centerpiece of the exhibit. Graphics above the space paid homage to the original Dodge brothers, reminding attendees, “They May Be Gone, But Their Spirit Still Drives Us.” Another cool touch: a glass-enclosed display of the Supercharged Hellcat engine. Experience: Attendees lined up for more than an hour to try their hand at the interactive experience for the Charger Hellcat in which they could look through the windshield from inside the car to view an 80-inch plasma screen and play the Dodge Charger Challenge video game. It was like a video driving game on steroids as the players were in a real car, not a simulator. Actuators under each wheel animated the experience as the car shook from side to side or forward to back. Design Cues/Highlights: Most of the investment for this exhibit went into staging for the Rebel reveal, which brought between 400 to 500 journalists into the space. Much of the remaining space illustrated an American worker/farmer story through authentic materials such as real barn wood, concrete and milled steel, reflecting the textures of American pride—a theme that runs throughout Ram’s advertising and carried over into its display as well. 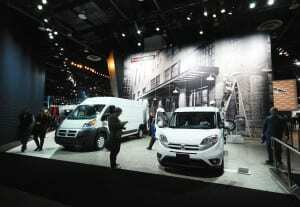 The theme continued in the commercial truck area where a wall-sized black and white photo of an industrial warehouse scene set the tone. 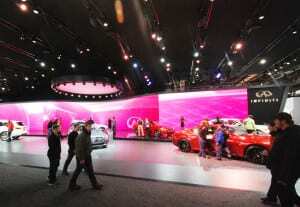 Experience: Like most of the Fiat/Chrysler brands, the stand featured high-res LED screens playing video content. Design Cues/Highlights: To illustrate its heritage story and remind everyone that it’s been around a long time, Alfa Romeo brought in three classic cars, one of which has never been seen outside of the company’s museum in Italy. All three, along with the 4C Spider, were cordoned off and displayed behind glass walls. Experience: There was nothing over the top here, but with the dazzling cars and the excitement generated by the fact that Alfa Romeo is back in the states, no one missed it. 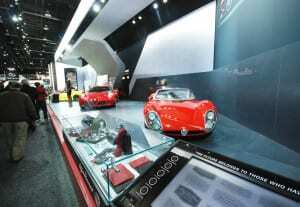 A historical timeline and interactive touch screen illustrating the history of the Alfa Romeo logo reinforced the brand’s heritage. Design Cues/Highlights: This award-winning display featured an amphitheater and an engineered structure made of lightweight materials that created a 150-foot span, or “halo”—a floor-supported overhead ring that seemed to defy gravity and float above the entire area. A large turntable and staging area were located where the ring met the floor; the remainder of the display formed a terraced platform on which attendees could sit or stand at different levels and watch presenters discuss the Nissan Titan, which rotated on a center turntable. Computer animations running on a large screen behind the vehicle zeroed in on the features and rotated along with the truck, enhancing the presentations and adding a visual punch. To involve the senses, three soundtracks set the mood depending on the time of day, while a scent of green tea added to the experience. Experience: “Digital Landscaping” engaged attendees in a non-traditional way. The exhibit featured a mobile app that enabled visitors to log into a virtual tour of the space, interact with content in real time, receive product information and bring Nissan’s Innovation Wall to Life. In a fun twist, they could play a GT-R racing game on their devices and compete against others logged into the tour. 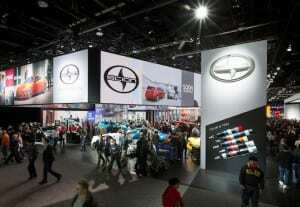 For additional information about the cars and trucks, they could try out the interactive, gesture-based content that ran on seamless video screens lining one wall of the booth. 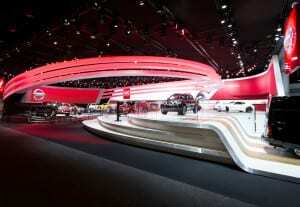 Design Cues/Highlights: This striking display focused on cars and content. A raised black stage in the back of the space, covered in glass, showcased one vehicle on a turntable that seemed nestled into the curved wall that ran floor-to-ceiling LED content. An Infiniti Design Studio took attendees through the design process from inspiration to ideation to finalization and the overall design aesthetic of the vehicles. This area featured a MakerBot replicator that produced a 3D model car and captivated attendees as they watched it take shape. Experience: For Formula 1 racing fans, the Red Bull Infiniti car displayed in a corner of the exhibit engaged the eyes and ears. Attendees could stand on markings on the floor to trigger the huge sound of the racecar, which put them into the heart of an experience that they not only heard, but felt. And, for an additional shot of energy, attendees could recharge their phones, and themselves, at recharge stations in the Infiniti Lounge. Design Cues/Highlights: Anyone who missed the large twisted sculptural “ribbon” made of simulated wood and carbon-fiber metal that seemed to float in the air must have been half-asleep. The iconic form served as a metaphor for Man Machine Synergy, or even more simply, illustrated a curving racetrack or road that conforms or bends to the will of the driver. 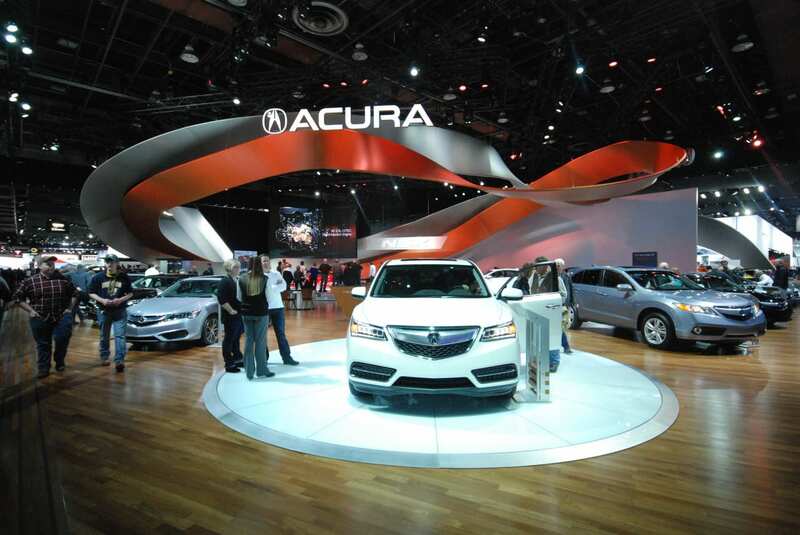 Experience: Acura put on more than just a pretty show. 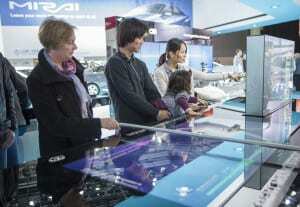 It brought the synergy of its man and machine story to life via a holographic interactive unit in which attendees used gesture control to navigate 3D car models and interact with on-screen content. Waving their hands in front of a camera sensor triggered media in a video that correlated to their movements, alerting users when their car deviated from its driving lane or was about to crash. 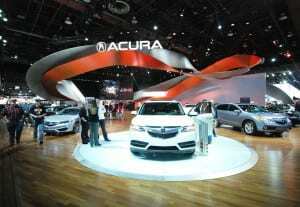 The Acura Connected Living experience was an informative tool about the products. Design Cues/Highlights: A dynamic, angular “inverse” entrance marked the spot where attendees entered and exited this exhibit. Large, bold graphics and simplified messaging told the story here. 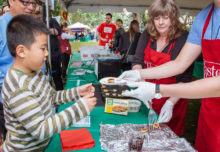 Experience: The stand brought the story of hydrogen fuel cell technology to life with hands-on experiences similar to those in a science museum. One display showed the components in the undercarriage of the vehicle. Another demonstrated the energy creation that takes place when hydrogen and oxygen are mixed by illuminating a light bulb. Color-coded plates within the fuel cell, along with content, explained how as hydrogen passed, it created the energy reaction. 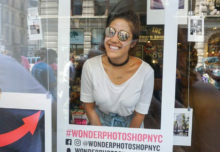 Experience: A highlight was the Scion Swag Machine, an Instagram-powered, near field communication (NFC)-enabled vending machine that rewarded visitors with prizes for taking images with their mobile devices and posting them to social media with a Scion-event specific hashtag. The Scion Power Player, a touchscreen video jukebox monitor, entertained guests while waiting for their phones to charge. It also featured a touch screen which they could use to choose video content from the brand to learn about the vehicles. A holographic Futureviewer video experience with content projected on planes of glass for a 3D effect brought the iM Concept to life in a visually exciting way. Design Cues/Highlights: This simple display made a statement in black and white, except for the featured car, which was red, and presented in the center on white ceramic flooring and bathed in light emanating from a white light box in the ceiling. Micromesh fabric used on exterior signage created a dual-layered dimensional graphic message. 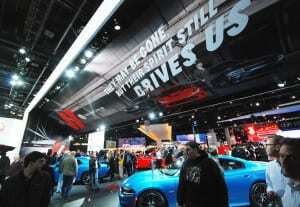 A Design Studio, located on a wall of the exhibit, showcased color chips, wheels and other design specifications, along with information on dealership locations and recharging stations for attendees wishing to build their own car. 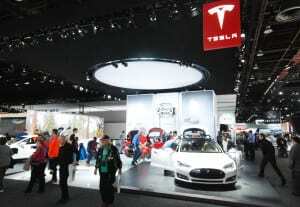 Technology: Two custom interactive engagements supported the vehicle features unique to the Model S—the new dual motor and auto pilot technologies. Both engagements took place on machined aluminum tables with a smoked glass interactive surface (Agency for all exhibits: George P. Johnson, Auburn Hills, MI).